Apple is preparing to open a third retail store in Turkey, reports MacReports, citing a source familiar with the company's plans. Set to open in Istanbul, the store will launch later in 2016. Apple is said to be in the process of hiring for retail positions at the store and has posted advertisements on job sites in Turkey. 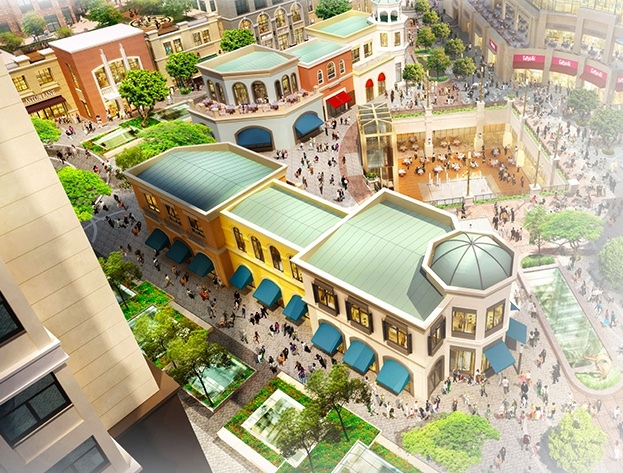 The store will reportedly be located at the Emaar Square Mall in Istanbul. Still under constriction, the Emaar Square Mall will feature 491 stores and restaurants, a hotel, and apartment space for residents. When it launches, the Emaar Square Apple Store will be the third Apple retail location in Istanbul, joining retail stores at Zorlu Mall and Akasya Mall, both of which opened in 2014. Turkey's Zorlu store opened with quite a fanfare as it featured a unique design with an all glass exterior. No offence to Turkey or the people living there, but is there really that much demand for Apple products there that there needs to be a third Apple store? Wouldn't it be better to focus on new countries first? I am from istanbul and I can vouch for that that the demand here is very very high. The thinnest rollercoaster ever built! I see plenty of bad CGIs in my office, but this one is ... unique. It looks like The Sims. Well first there is a massive shifting from once so popular and distinctively outnumbered premium retail stores and repair services to Apple Stores here in Istanbul for some reason since the opening. And it is visible. You can see people piling up any day in both stores making huge lines standing, and even online services, it is sometimes impossible to get a reservation here. If you don't have any reservation, you will be ignored on a busy day and find yourself vigorously trying to latch on one single person with Apple shirt to ask one simple question. Oh yes, it is wild here. So yes, a third store here in Istanbul will certainly not be an overkill. Next should be WORLD™, a Disney-esque amusement park with Apple rides and technology of all kinds. Opening another store in a country is cheaper than opening the first one in a new country due to all of the regulations, language barriers, recruiting difficulties etc. Even different cities in the same state creates difficulties. IKEA did not open any stores in the Bay Area for years, even though it had multiple stores around Southern California. Still, I agree, it is strange that Apple still does not have any stores in Vienna, Dublin or Singapore. Sales experience and after sale service is a big part of the value proposition of Apple, so it is amazing that Apple is able to sell as briskly as it does in places where it does not have any stores (or too few to make them practical options). In any case, Istanbul is a very big town, with more people living there than the population of many European countries (Belgium, Greece, Norway, Switzerland etc.) It is also a popular tourist destination. Even though typical income level is not that high, enough people can afford Apple products that people stay up till midnight to see if they can get a Genius appointment, because all slots are taken a few minutes later.